Recently whilst reading about Vix’s amazing adventures in Goa, she wrote how the only place that she feels most alive is in India – and this really got me thinking. Where do I feel most alive? Am I even close to finding true paradise? 1. Paris I spent my whole life dreaming of Paris, this huge part of me had this burning desire to visit one day. I grew up idolising Joey Potter and Carrie Bradshaw who themselves dreamed of the city, and this made me incredibly intrigued as I’d always strongly related to their ambitions. I collected all sorts of Paris memorabilia – even though I’d never stepped foot into the border of France. I was besotted with images of the Eiffel tower and studied the French language at GCSE. All this concluded: I was always destined to visit one day. Last March I was whisked away to Paris by my Mr – he obviously knew how much Paris meant to me, and all of the dreams I had stored. The single most significant day of my life occurred at the very top of the Eiffel Tower and for this reason alone I believe a part of my heart will always belong in Paris. When you dream of visiting somewhere for so long, and it not only lives up to every expectation, but also surprises you in ways you didn’t think were possible, it leaves you completely and utterly fulfilled. 2. Brighton Brighton is my ultimate escape. 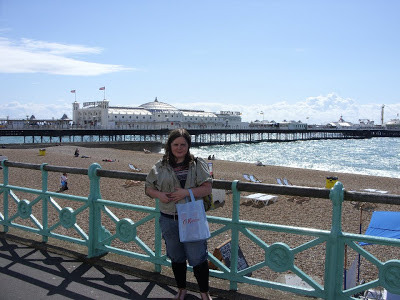 I feel a whole different me when in Brighton, I feel culturally richer and more confident than I ever do in everyday life, I never need worry about being me. Deep down I knew all along it was my kind of place – from swooning over Sugarush, I just knew. My trips to Brighton have confirmed a love I knew all along: the culture, the mods, the rockers, the VWs, the vintage, the retro - all in one fabulous home. 3. To be discovered... This one is blank, because there is a part of me desperately wanting more miles, more countries and ultimately more travel in my life. We’ll have to see where this takes me. Where are your top 3 destinations? What a fab read, Alice! I'm so glad Paris exceeded your expectations. It's been years since I was last there and I'm always afraid to return to places I went to a long, long time ago in case my happy memories are shattered. Brighton is wonderful, too. Cosmopolitan, broad minded and vibrant, it doesn't feel like England at all! I'm afraid India's spoilt me, everywhere I've visited since (even Brazil) feels regimented and stifling, there's nowhere else in the world with so much colour. I loved this post Alice. To be honest I have trouble finding such 'at homeness' anywhere. I would have to cite the depths of the countryside, somewhere with wild flowers and a blue sky. I'm still searching.